In the last post I suggested that the use of blue light to stimulate erections was a sure-fire candidate for an IgNobel Prize. 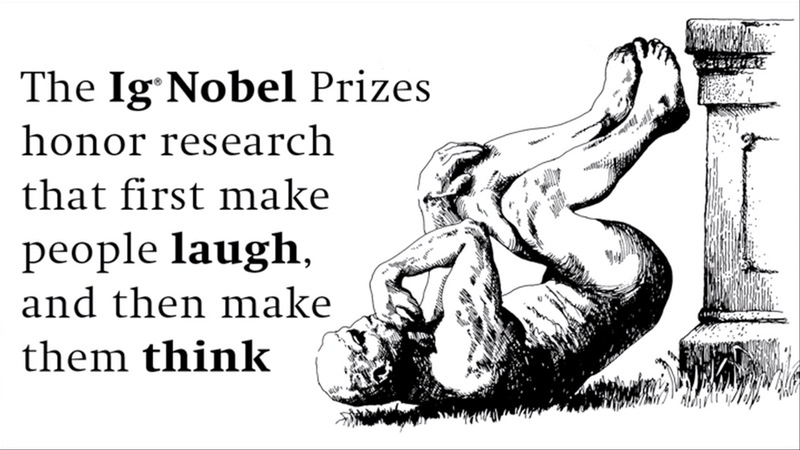 But what is an IgNobel Prize? How does one go about winning one? And should one want to win one? But this was not the only intention, although many people interpreted it in that way. According to Marc: “That original phrase was the best short summary we managed to come up with at the beginning, but we were not entirely happy with it — because some people interpreted it ONLY [in that] the way … . Whenever I would TALK with someone, or had a more extensive email (or whatever) exchange, I’d explain that the “Cannot be reproduced” part included “cannot be the FIRST to LEGITIMATELY claim FIRSTNESS,” and thus the prizes could honor pretty much anything, good or bad. But it took about seven frustrating years or so to come up with a reliably better phrase. The change peaked at around time that I received the Physics Prize in 1999 (for using physics to work out the best way to dunk a biscuit), when many of the prizes were going to genuine scientific projects that looked bizarre on the surface, but were actually soundly based (see my post 52 “The Man Who Fed Prozac to Clams”). “First, they make you laugh; then, they make you think” became the new catchphrase. It’s an admirable motto for a prize that is now helping to draw people’s attention to science, and continuing to help them distinguish pseudoscience from the real thing. But how does one go about winning one? And should one now want to win one? The answer to the last question is often “yes” – at least, for people who have a sense of humour, and who are adept at using journalistic attention to promote the cause of genuine science. In fact, more than one professional science communicator has sought my aid to get nominated. But deliberately seeking an IgNobel is, to my mind, almost as silly as orienting one’s research in the hope of winning a genuine Nobel Prize (sorry about that, Jim Watson). Far better to focus on the science, and let the prizes take care of themselves. In the next post we will meet someone who did just that, and who is the only person to my knowledge to have scooped both a Nobel and an IgNobel Prize.